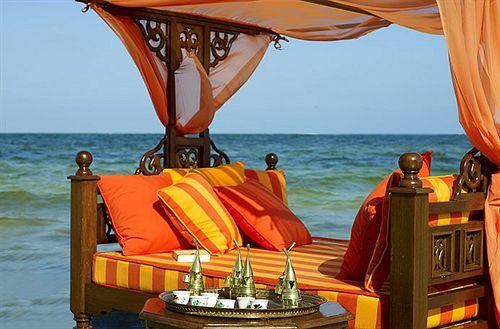 Sarova Whitesands Beach Resort is East Africa’s largest and best known resort. It is located on Bamburi Beach, on the North Coast of Mombasa. A fusion of Swahili interiors and Arabic architecture, the resort is spread over 22 acres of exquisite gardens and has the largest beach front on the north coast overlooking an ocean teeming with unique marine life. A balcony and pool or sea view ,Satellite TV, tea/coffee facilities and hair dryers,Mosquito net over each bed,Air-conditioning,Direct dial telephone, wireless internet connectivity,Private bath, shower and WC,Voltage of 240 volts and 50 cycle razor outlets operating on both,220 and 240 volts. The Presidential Suites are located in a serene and private spot on a secluded island overlooking the Palms pool. The suites are truly luxurious, each comprising two superbly appointed master bedrooms with king and queen size beds, ensuite bathrooms and a jacuzzi. The large lounge in each suite is attached to a kitchenette and a fully stocked bar. Exclusive car parking slots are located nearby. A butler is assigned and available round the clock to ensure a most comfortable stay. The expansive Acacia suites, most with ocean views, feature spacious lounges and bedrooms. They are available as one or two bedroom suites, all with ensuite bathrooms done up in luxurious style complete with persian rugs. Palm Rooms are located in the rooms blocks around the picturesque Palms pool. The large spacious rooms with high ceilings and ensuite bathrooms, are done up in warm colourful hues lending them a very inviting appearance. All rooms have balconies that overlook the Palms pool, colourful bouganvillea and frangipani trees. Sea Front rooms have an unimpeded view of the expansive tropical waters of the Indian Ocean beyond the landscaped greens and swaying palms. 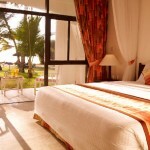 The Standard Rooms at The Sarova Whitesands Beach Resort are anything but standard. You’ll find the kind of comfort and detail in each room that will certainly make your stay a pleasure. 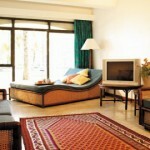 In addition to the above the resort has three specially equipped rooms for the physically challenged.